This is SystemStar's main window as it initially appears. Rather than describing the size of your project as a point estimate, SystemStar lets you describe the size with a probability distribution. SystemStar runs a Monte Carlo simulation to sample your distribution, and calculates the COCOMO or COSYSMO estimates for each sample. The results of the Monte Carlo simulations indicate the probability that you'll be able to complete the project for a given cost (or duration, or amount of effort). 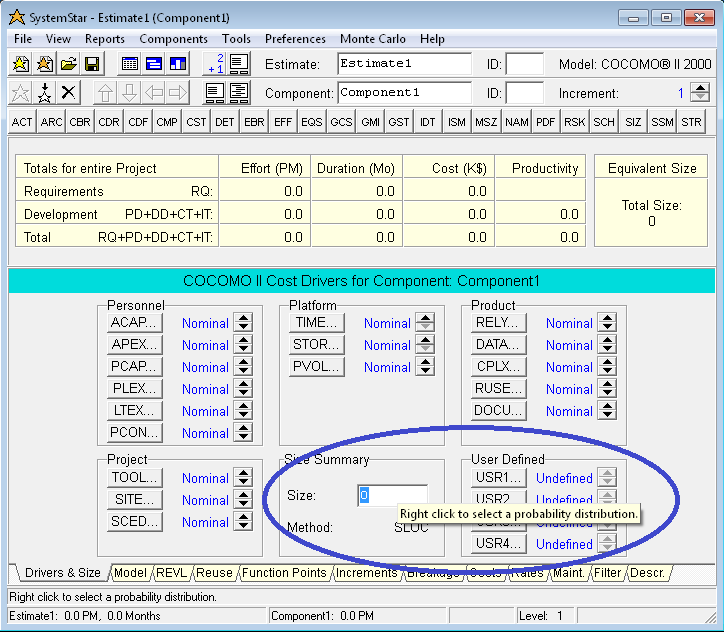 Right-click in the Size field of either a COCOMO or COSYSMO estimate and pick Select Distribution... to display the window that lets you select a probability distribution.